Treat the most important person in your life to the sweetest of gifts with this sterling silver tree of life design pendant. 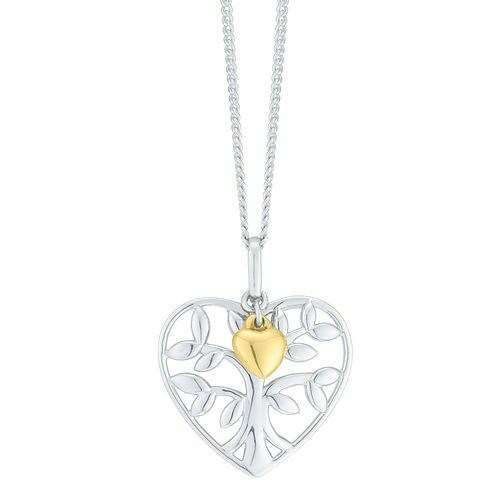 Symbolise the love within your family with this gorgeous tree of life design set in a heart-shaped surround and accompanied by a small 9 carat gold heart charm. Set on a sterling silver curb chain, this necklace will make the perfect gift for those special people in your life. This pendant is 18" in length. Sterling Silver & 9ct Gold Tree Of Life Design Pendant is rated 4.8 out of 5 by 26. Rated 5 out of 5 by Anonymous from Beautiful design A very pretty necklace with a distinctive design that will remain contemporary for years to come.